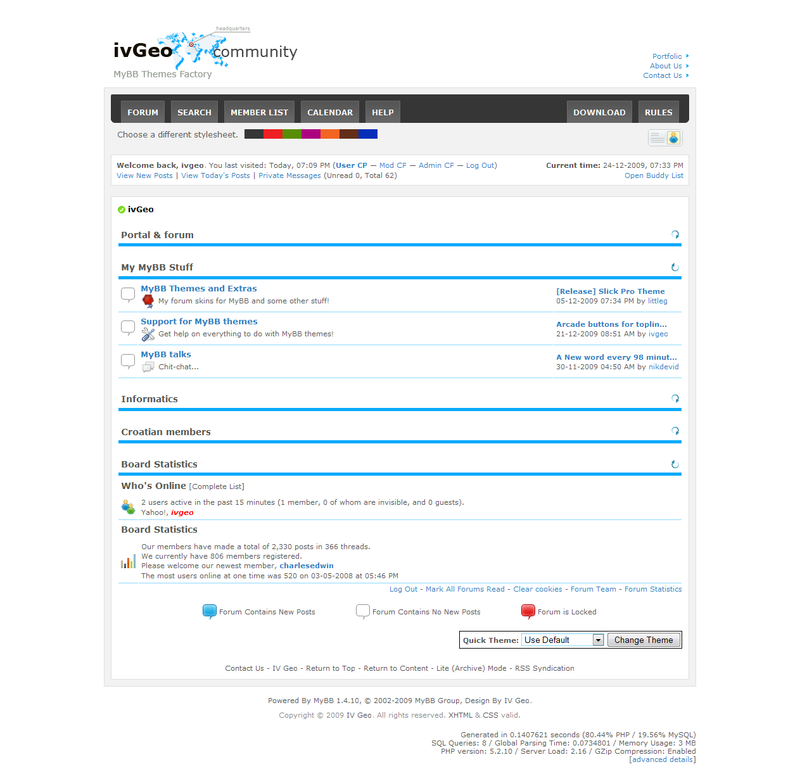 ivGeo v3 Theme for myBB 1.4 is another simple theme with style switcher to give choices in terms of menu and link color schemes. This theme is very light and loads very fast. This entry was posted in MyBB, Slides and Work and tagged ivgeo, light, style switcher, v3 and white. Bookmark the permalink. Both comments and trackbacks are closed.. I can’t say I understand you. What is wrong with this theme? Is this happening with default mybb theme too or just ivgeo v3? Weird character shouldn’t be theme related, at least I have never experienced such problem. Won`t work on MyBB 1.4.11? It should work, it is used here on MyBB 1.4.11. No template changes in MyBB 1.4.11. There was a problem with postbit buttons, but I solved that. Hi Stefan, sorry for bugging you. What was the problem so I can fix it in future releases? Not the problem at all! Problem is missing postbit buttons, some buttons are not included in image folder (maybe by mistake). I solved that by downloading that buttons from your image dir on server. Hi Kevin, How can I use your style switcher option? I mean how to I switch between the different color styles? Between navigation and welcome block on the right side there is a white and blue icon. When you click on it you should see few squares with different colors to choose from. Just click on the one you like. Maybe you should add a small text saying “Theme Color” above the color changing icons. It would look good with a small bold text. Thanks for your suggestion, I’ll probably do that in the next update. Good design, when do you think that you can publish ivgeo3’s wordpress theme. You can be sure that it will downloaded to much by mybb users. Could you publish it please?